A few weeks ago I was flipping through Anna Thomas’ Love Soup to find some soup recipes for the winter months. Near the back of the book I saw an entry for Parmesan and fennel biscotti. I was intrigued. The recipe looked delicious but I wondered if I could substitute the fennel for something else. In the fall I had made a trio of savoury muffins and I thought about pairing parmesan and garlic instead. Or if I was really ambitious I could make biscotti in each flavour like the muffins! I started make my plan but with everything I was buying for holiday baking I decided just one flavour combination would be enough: walnut and rosemary. 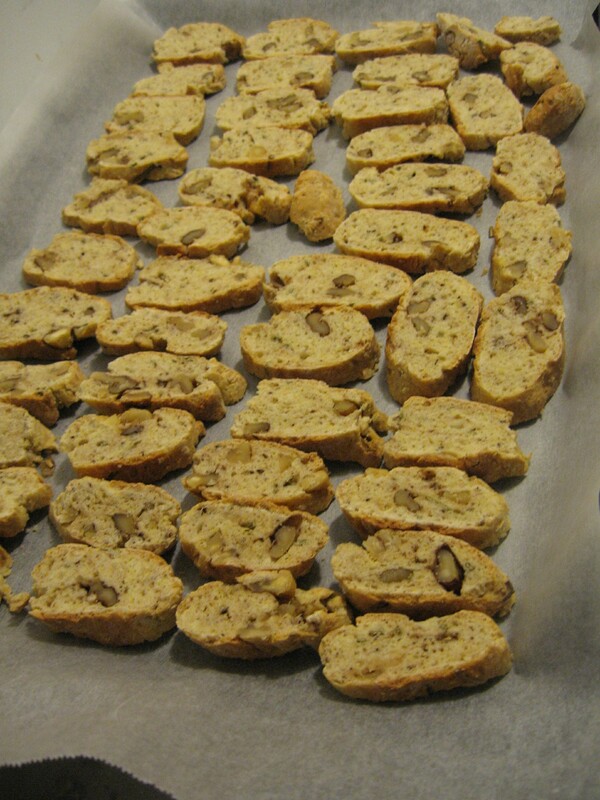 These biscotti were delicious – great with a sharp cheddar cheese and a nice glass of red wine. We actually ended up eating most of these with soup or as an appetizer. Not exactly a cookie but nice to have around the house to snack on. Preheat the oven to 375 degrees. Line your baking sheet with parchment paper. Prepare your kneading surface by lightly flouring it. In a large bowl combine the dry ingredients: flour, masa harina, salt, pepper, baking powder and baking soda. Whisk these together. Using a fork stir in the rosemary and walnuts. In a small bowl use the same fork to beat together the eggs and the buttermilk. Pour the wet mixture into the dry mixture and stir together with your fork until a crumbly dough forms. You may need to use your hands to get it to stick together. Now transfer the dough to your floured surface and knead it into a smooth ball. Wrap in plastic wrap and let it rest for 15 minutes. Remove 1/3 of the dough and leave the remaining dough wrapped in plastic. 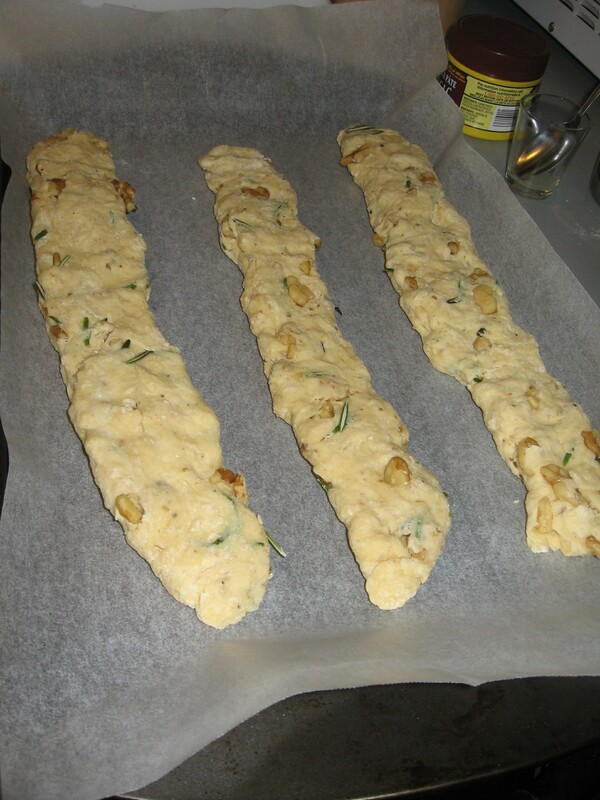 Roll the dough into a log about and inch wide and place on your baking sheet. Flatten the top using your fingers. Don't worry if they are not even -- you'll be slicing them into smaller pieces for the second baking stage. Repeat with another third of the dough and leave about two inches between the logs. Repeat with the last 1/3 of the dough. Bake for 20 minutes. They will have a nice golden brown hue. The golden brown hue you will see after the first baking. Let cool on the baking sheet for 10 minutes and then transfer to a wire rack to cool. They must cool for at least 30 minutes. Don’t rush this step! In the meantime, lower the oven temperature to 225 degrees and line 2 baking sheets with fresh parchment paper. Using a bread knife, slice the baked logs about a 1/4 inch thick. Place the slices on the baking sheets and bake for 35 minutes. You don’t really need to leave any room since the biscotti will not be expanding anymore. After the 35 minutes is up flip the slices and then bake another 35 minutes. The biscotti will be crisp and dry. 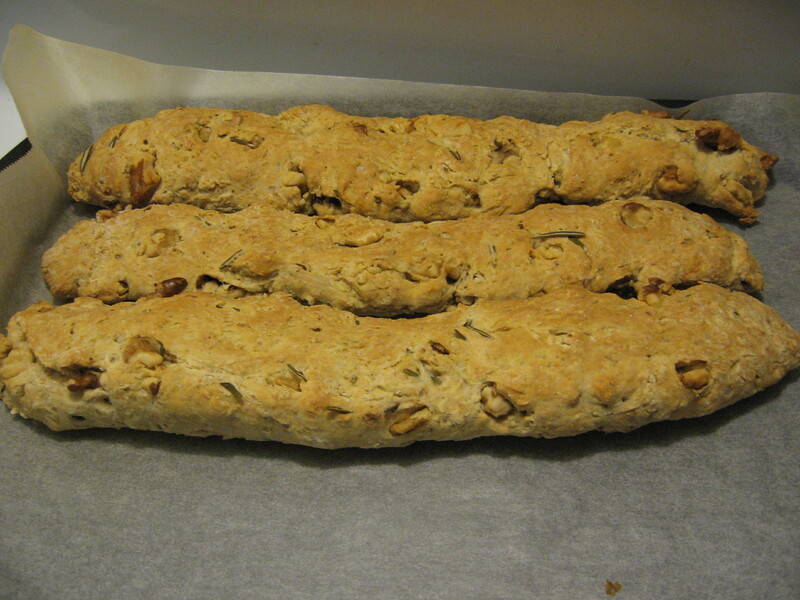 This is the biscotti before their second baking. After the second baking the cookies will be more brown and the edges will be crisp. Remove from oven and transfer to a wire rack to cool. Biscotti will keep for a couple of weeks in an air-tight container.